Dry, damaged and unruly hair are, unfortunately, a common problem among a majority of women. Usually, the blame is on us, because of exposing our strands to damage by colour-treating, straightening, bleaching, blow-drying with hot air. Additionally, there is also a diversity of other factors (beyond our control): strong sun, frost, dry radiator air. All of this is responsible for your wisps becoming weakened, lack resilience or shine and start looking worse: they are unruly, brittle, fragile and difficult to style. In order to harness and regenerate your hair you will need a proper cosmetic. A product that contains natural oils will be the best to do this jobs. Keep in mind that natural oils are famous for their conditioning and moisturising properties. One of the cosmetics of such properties is a hair conditioner from Aubrey. It contains camellia, argan and macadamia oil. Additionally, it has olive oil that will intensify the effects of camellia oil. 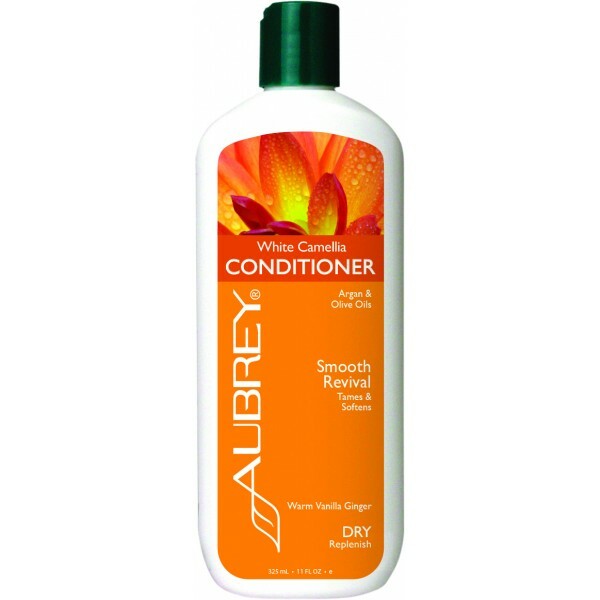 Aubrey product comes in a large (325 ml) white bottle, with an orange, flowery label. Even though the packaging (unfortunately) does not arouse positive emotions, the content encourages to take a closer look at the properties and effects. The main task of Aubrey White Camellia Conditioner with argan and olive oils for dry and damaged hair is to smooth hair difficult to style and provide a proper level of moisture. They key ingredients in this product are natural oils and an extract of organic aloe vera – known and valued for ages for its moisturising and adding gloss effects. Camellia oil contains a large amount of oleic acid, which is responsible for slowing down hair ageing processes. What is more, camellia oil adds beautiful shine, facilitates styling and deeply moisturises. Not everyone is aware of the fact that camellia oil also soothes any irritations occurring on the scalp and helps overcome dandruff. Camellia oil is a source of vitamin E, also called ‘the vitamin of youth’. Moreover, olive oil contained in Aubrey conditioner improves the effects of camellia oil due to the facts that their components are very similar to each other (the only difference is a lower amount of oleic acid). Furthermore, argan oil protects hair from damage and perfectly conditions unruly strands. Macadamia oil regenerates hair deeply and absorbs completely into the wisps, without weighing them down. Unfortunately, the beneficial effects of oil is interfered with drying alcohol (alcohol denat.) that appears in the composition. Although its devastating effects will be soften by camellia oil, the manufacturer could have skipped this ingredient or replace it with another, so-called good alcohol of the polyhydric group. Camellia oil, hair and men’s beard. How does this Japan cosmetic work? Camellia oil Copyright © 2019.